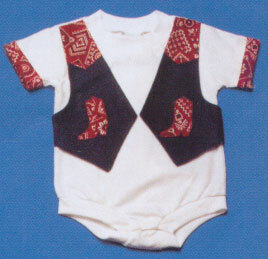 With this outfit, your baby will be the best dressed Cowboy in town! These unique outfits are the work of the Kiddie Korral Company, and they are made in Texas. In addition to the red bandana accents, this one-piece outfit features an integrated denim vest with boot patterns sewn into it.